Once again the week is a blur. I woke up on Monday morning in disbelief that I was starting another work week, and the next thing I knew I was driving home from school on Friday evening – thankful for the weekend. Despite living at what seems to be the speed of light, I did manage to set aside some time for personal exploration in addition to the typical grading and lesson plans. In an effort to fully live out my motto “Work Smarter – Not Harder” I strive to set aside some time each day to do at least on thing that I truly want to do. Some days I may only set aside an hour – but other days I am able to devote more significant time to personal pursuits. This week I managed to spend a few hours going out to dinner and catching up with an old friend. We always have such fun when we get together; we just wait too long between visits. I will try to remedy that in the future. 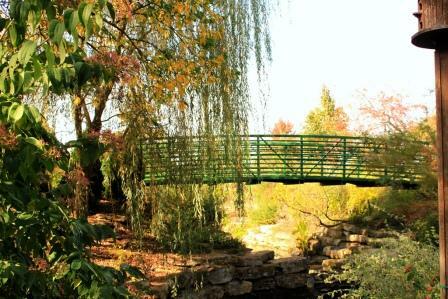 I also took an afternoon and visited the Arboretum to practice taking nature photos during this fall season. A few of the trees were changing colors, and some of the flower beds had transformed from spring pastels to autumnal colors and I enjoyed meandering through the gardens. My favorite photo of the day was taken in a section of the park entitled, Monet’s Garden. I felt as though this photo truly captured the essence of this impressionist artist. Most of the classes this week spent time honing writing skills. My 9th graders learned how to organize their note cards for a 5-7 page research paper (which I will get to grade over Thanksgiving break) and they are now working on developing their thesis statements. My 7th graders learned to peer edit and they will be presenting their final Fractured Fairy tales tomorrow (which I will be grading this week). Eighth graders continue to work on A Midsummer Night’s Dream and slowly but surely they are starting to come out of their shells and truly “become” the character while on stage. It is fun to watch. The ninth graders are also reading Fahrenheit 451 and I have enjoyed some lively classroom conversations. I received a library book this week entitled, It is a Book by Lane Smith, and I thought that it was a perfect read-aloud for these students. Yesterday I shared the book and it did receive a few chuckles here and there (where do I plug it in? You don’t. It is a book! Can you text with it? No. Can you wi fi? No.) But the theme of this children’s book resonates of the society that Ray Bradbury has depicted. Television, video games, cell phones, and computers are mainstays for youth today — but an old-fashioned paper book? Not so much. It does give me cause for concern. Last week I shared an epiphany: I have not been a fan of chick lit because it is too similar to my own life and when I read I wish to escape life, not relive it. This has been a true AHA moment for me and somehow I feel liberated. I am not sure why – but I guess feel as though I am free to read this genre without guilt that I am not reading something much deeper and thought-provoking. It is ok to read something light for a change. To that end, I have read three (yes – THREE) books this week. I finished Round Robin and immediately began reading the first book in the Elm Creek Quilt Novel series, The Quilter’s Apprentice. This book gives the backstory of the main characters and how the Elm Creek Manor was renovated to become a quilter’s paradise. I have also started the third book in the series, The Cross Country Quilters, which is going to introduce me to some new characters to study. I also decided that if I was going to read chick lit – then I should include the queen of that genre, Debbie Macomber. I have only read one of her books in the past, Twenty Wishes (which I reviewed here) and I did enjoy the female fellowship that develops throughout the story. I did a bit of research and decided that Thursdays at Eight would be a good novel for me to read as “research” for my current Work in Progress. I made a wise choice. It follows the relationship of four women who meet at the local coffee shop every Thursday morning to encourage and support one another. They originally met in a journaling class, which explains the structure of the story being told in alternating narrative and diary formats. It is a quick read, but the characters are developed well and their lives are intriguing enough to keep me interested. Finally, I also read a scrapbook mystery entitled Paper, Scissors, Death by Joanna Campbell Slan. I originally thought I wanted my protagonist to be a part of a dedicated group of women who met on the pretense of cross-stitch, but really got together for fellowship and support. I have now decided that the flow of the story would work better if they meet to scrapbook instead. I wanted to do some background reading on crops and workshops to get the flavor of how to write about page layouts, scrapbooking supplies, etc. and I happened to have this book on the shelf. It is an easy-going cozy mystery that had enough suspense to keep me interested, but I am not sure that there is enough interest to read the remaining two books in the series. It was fun, however, to read about St. Louis and some of the places in the Midwest with which I am familiar. So in the spirit of living each day to its fullest, I went on an adventure yesterday. Well, it was an adventure for me. I attended a regional kick-off meeting for NaNoWriMo. It was held at the central branch of our local library and I went by myself – not knowing a single person there. This is a HUGE step out of my comfort zone. There were about 40 people in attendance and I was thrilled to see that there is no stereotype of a NaNo participant. There were men and women; teens and retirees; veterans and rookies. The three leaders were as different as could be – which gave hope that anyone can be a part of this insanity. The two hour meeting focused on basics of the event, brainstorming ideas for writer’s block, and a few group writing exercises. I am very glad that I attended this meeting yesterday, although I am not sure how many write-ins I will attend during the month of November. While I embrace the idea of getting together to squelch the feeling of writer’s isolation, I am not really a competitor for “most words written in 10 minutes” or “incorporate the idea of fire retardant underwear in your story” (no joke – that was a plotter’s plot suggestion). I may find enough support within my school community. I currently have 14 students signed up for the event and I am thrilled. Some are even planning a sleepover on October 31 so that they can start writing promptly at midnight on November 1st. They are my encouragement. Good luck with NaNoWRiMo. I'm trying it for the first time this year. Have an idea in mind and have to restrain myself from starting too soon! LOVE that you attended the NaNoWriMo meeting!! (Now how to figure out how to get my library involved next year…) So glad to hear you had such a great week! Oh, I can relate to being out of one's comfort zone in groups…and yet, I've often found intriguing outcomes in these ventures. But I'm not one who likes to "compete" in this arena. I like support, but on my terms. I'm even kind of a hermit (who spent more than thirty years as a social worker, knocking on doors of strangers and dealing with family issues up close and personal…yeah, that kind of hermit!). Funny how I could do that (way outside my comfort zone), but now I'm like a turtle pulling into its shell. I do find online support great, though. When I first finished my master's degree, all those years ago, and after all the "deep" books in college, I found chick-lit liberating. So now I feel no guilt in reading it. I'm doing NaNoWriMo, too, as you know; I'm curious as to what will happen. Molly, glad you took some time for yourself in various ways. You picked some good authors to start your "lighter" reading. Both Debbie Macomber and Jennifer Chiaverini are favorites of mine. I've read all the books you mentioned and enjoyed all of them. Good for you! Good luck with your writing! I admire anyone who gathers the courage to participate in NaNoWriMo. The fact that you did step outside your comfort zone and attend that meeting just shows how motivated you really are! I can't wait to hear how it goes. I'm impressed with how much you fit into a week. I bet your weeks are a blur – I don't have a job and mine are. Congratulations on stepping out of your comfort zone and going to the meeting! Molly so happy to see you found time for yourself this week and had fun with your friend as well –so important. Hope this week is a good one for you as well. I'm going to have to check out that Lane Smith book! Sounds like it might lead to some interesting discussion in class. I must admit to enjoy chick lit every now and then and I am presently sorting out a list of books for December that are light and Christmassy. Debbie Macomber and Nora Roberts already feature and I don't feel bad about it at all. Good luck with NaNoWriMo. I will be blogging right by your side. I like that you're setting time aside for yourself, so often as women we forget to do this!! The gardens look marvelous and I'm sure you took some fantastic shots. I want to be a student in one of your classes!!! I love the Elm Creek series..so glad to see that you're enjoying them, and of course, I love Macomber too!! Good for you for stepping outside of your comfort zone!! It is truly scary how fast the weeks fly by! I have never been to a NaNoWriMo meeting – it's inspiring to hear what they're like from you. And it is so good to hear that despite the hectic week, you found time for yourself. That's always such a good thing! Molly, good for you that you are taking at least one hour every day to do something for yourself. Very important indeed. I like the "Monet" photo, very beautiful. I also like the way you write about chick lit – I enjoy Debbie Macomber, although I cannot read too much of her in a row. It very much depends on my mood. Good luck with NaNoWriMo – what a great project! Molly, I am so impressed that you have the energy to post such an extended and well-written post at this time of the school year! I feel like I am reverting to one-syllable words and simple sentences! If I can string together a few thoughts, it is a win! I am thinking about participating in that November novel thing with the funny name–and I love that your students are taking part! Molly, I really admire your ability to set aside at least an hour for you. Why is it we often feel selfish for taking such little time for ourselves? And I love that last sentiment–that you can't write anything good if you don't write at all! How true is that. Hope you have a wonderful week. Would love to see your class discussing Bradbury! Once again, I find myself motivated to do better by your post. It's a Book looks interesting – I may have to find it. The older I get, the more I find time for myself – ah, but, the older I get it seems the busier I am. I just stopped by to tell you how much I enjoy your Sunday Salon posts. It feels so much like a letter from a friend. Glad to hear you are taking time for yourself and you are doing so many encouraging things for your students. That Monet garden looks so awesome, and really does look like the paintings. It is strange the differences in the culture that my kids are growing up in. The other day I apologized to my son for sounding like a broken record. Then I stopped and asked him if he knew what that meant. He said, "When you do really well at something, better than anyone else and you break the record." I then had to explain how old musical records worked. I'm sure my grandparents felt much the same way though. Just one example of their unwillingness to deal with new technology? They had to be forced to buy a non-rotary phone by the phone company about ten years ago (as well as finally getting a private line because no one else wanted a party line anymore). Which is a whole different topic and I don't want to write an epic-length comment, but I did have a lot of fun listening in to other conversations on the party line when I was a kid. sounds like you're a bit busy! lol. i am so happy that your students are enjoying what you're teaching–i'm struggling mightily with my 12th grade class–slogged through beowulf and are on to the canterbury tales but they are ready to stone me. is it almost june yet?? ?